Thanks to Sarah and Jeff for including Wavelength in your special day! We always love playing at the Samoset Resort and cannot wait to help create a lasting memory on June 16, 2018 for you and your guests. We are also excited to team up with Two Adventurous Souls! 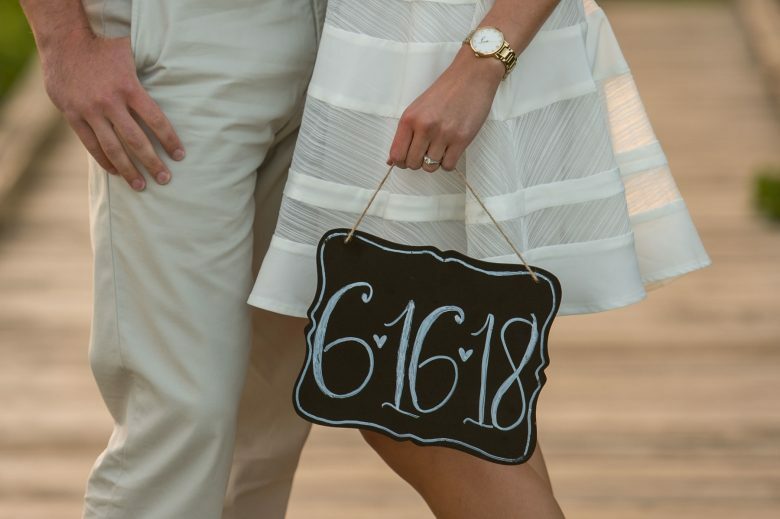 Thank you for sharing Sarah and Jeff’s engagement photos with us for the feature. See you in June! Meet The Future Bride And Groom. Sarah and Jeff live in Weymouth, about 20 minutes south of Boston. Jeff is an electrical engineer and Sarah is a compliance analyst. Jeff has the mathematical/science brain, more left brain, and Sarah is more creative and intuitive, more right side! They are both project driven people and enjoy working on house projects and cooking together. 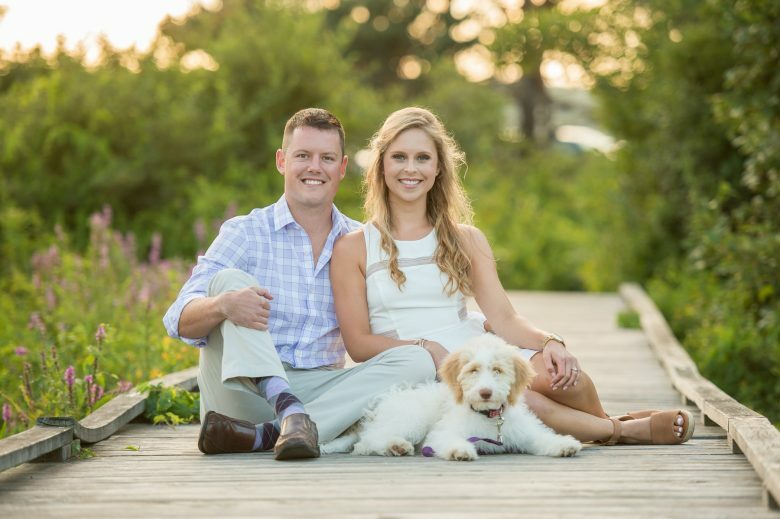 Although, their favorite activity is spending time with their puppy, Sammi, outdoors! We met through a mutual friend, Charlie, who I went to high school with and Jeff went to college with. We went to a birthday party of mutual connections, and Jeff came up to me and asked if he could buy me a drink! Let’s hear about your engagement. Jeff proposed to me on Thanksgiving of 2016. I love taking pictures with my DSLR camera, so when I asked him to take one with me on Duxbury beach behind his parents house, it wasn’t anything out of the ordinary. I set the self timer, got into frame, and it was then that Jeff got down on one knee in the sand. I asked him several times, “is this real?!?!?!”. I was in total and utter shock. Apparently, and luckily, through all the fuzz and adrenaline, I said yes! He timed the picture wonderfully so we have the perfect shot. I love that we got to share the special moment with each other, but still have the picture to look back on. Every time I look at it I cry. How did you decide where to get married? I spent most of my childhood in Maine at my family vacation house. I learned to swim in the rivers and ski in the mountains up there, so the state has a special place in my heart. Jeff’s family visited Samoset during his childhood and created memories there. When we went to look at it years later, we instantly knew we it was where we needed to say “I do”! What is the best part about being engaged? The best part about being engaged is the sense of partnership. We both bring different ideas and qualities to the table, and are learning how to work as a team even though we sometimes have different approaches. We emphasize the balance between our exciting plans for what the future holds and also just enjoying the current moment. Knowing our best days are yet to come is thrilling. What is your wedding vibe? Celebrating our love surrounded by the people who are most important to us. We plan to set aside certain moments to pause and look around and take everything in, because we know how fast it will go. Having all of our loved ones in the same room at once will leave our hearts exploding with love. How did you chose your entertainment? One of our top priorities for our wedding was a live band. Both of our dads play in bands, so we come from musical-oriented families. Music is a big part of our lives. I think that wherever you are, whoever you are with, whatever mood you are in, music instantly brings a certain energy that can light up our souls and connects us. I hope that our guests can fuel themselves through the music of Wavelength so that their worries are left behind and we can all live in the moment and celebrate life with open hearts and love. Do you have honeymoon plans? Yes! Two days after the wedding we will fly to Saint Lucia for five nights, and then Antigua for five nights! We plan to relax after a chaotic few months of wedding planning, but, knowing us, we will be exploring and going on excursions as much as possible!